I'm speaking in generalities. There are theistic evolutionists who are not actively trying to troll the Web and recruit Bible believers away from their faith. Also, there are yet a few professing atheists who really don't care what the rest of us believe, and want to go on about their business. A foundation for the religion of atheism is evolution, which gives many professing atheists a "scientific" explanation for the origin and development of life. Naturally, atheists attack Christians because it's their nature to do so (John 8:44, Luke 6:22, 2 Timothy 3:12). But they hate creationists even more, because creation wrecks their evolutionary foundation. When it comes to biblical ("young Earth") creation, they ride in at full gallop with guns blazing, because evolution requires time — a lot of it — and biblical creation science shows not only the flaws in evolution, but gives evidence for a recent creation. However, professing atheists are willing to sit down and play a few hands of poker with compromisers on creation. OECs ("old Earth creationists") are tolerated because they accept atheistic interpretations of scientific evidence. 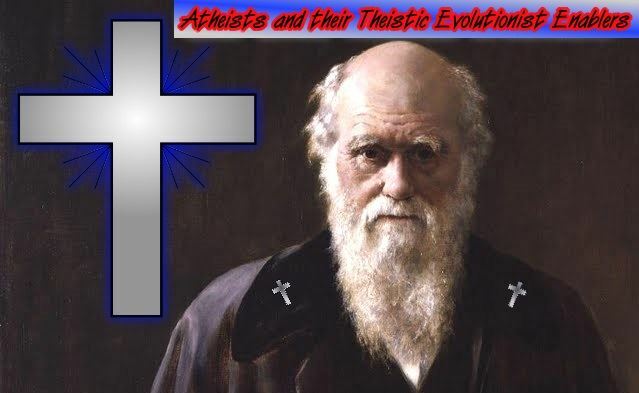 More than that, they are very fond of theistic evolutionists because not only do TEs reject the plain teachings of the Bible regarding creation, many join with atheists in riding for the evolution brand. In general, TEs and OECs reject the Bible's account of the global Flood. To say that God used evolution is downright silly, old son. Evolution is a wasteful and cruel. It violates Scripture, the nature of God, and good science. God completed creation in six days (Exodus 20:11) and said it was very good (Gen. 1:31). Adam was complete right away (Mark 10:6). No long ages, bloody struggle, survival of the fittest, dead ends, or any of that. Also, if death and suffering were a part of the way God did creation, it's mighty strange that the Bible refers to death as an enemy (1 Cor. 15:26), not one of God's creative tools. At the final consummation, there will be no more death (Rev. 21:4). No, you can't say that God used evolution and be consistent with the Bible. Both atheists and TEs will use appeals to authority or to popularity in an effort to bushwhack biblical creationists, saying things like, "The Pope and the Roman Catholic Church accept theistic evolution", or, "Biologos believes it". What are they expecting? That we'd say, "Oh, well if they believe it, I'd better change my views." Not hardly! That doesn't make evolution right. Also, some of us don't cotton to throwing in with false doctrines just because someone else is doing it (1 Tim. 6:3-4). No wonder the whole passel of sidewinders share a table — they all reject the authority of Scripture, and the compromisers (sometimes called "reasonable" or "honest" Christians by tinhorn atheopaths) are well down the road toward atheism. And yet, the professing Christians in that gang often claim to believe the Bible. Do they? Let's have us a look-see at what effect theistic evolutionists are having. Many TEs work with atheists to ridicule biblical creationists because evolution is more important that what Scripture teaches about how Christians are supposed to treat each other; mockery and abuse are not in the canon. When evidence for a young Earth is presented, or when evidence refuting evolution is given, they circle the wagons and open fire on those of us who actually believe the Bible. (Looks like Paul was talking about something else when he said that we are supposed to be destroying arguments and strongholds against the Word of God, 2 Cor. 10:4-5 ESV.) Today's culture has many pagan elements, and Christians need to start with creation in our evangelism efforts. F'rinstance, when Paul argued with the Greeks in Acts 17:22-33, he began with creation because the Greeks were evolutionist pagans, not monotheists. For that matter, I've been attacked by theistic evolutionists who were so vituperative, I thought they were atheists! Same bad reasoning, condescending attitude, equivocating science with evolution, giving science philosophies (which change and disagree with each other), the magisterial position elevated above Scripture, and so on. No wonder I thought the professing Christians were atheists. (Actually, some of them are atheists; I've caught them lying and pretending to be Christians, such as this one.) Interesting how they claim to love science, but refuse to consider how the biblical creation model makes more sense than evolution. Theistic evolution is a denial of God's Word, and therefore a false teaching. Certain TEs are enabling atheists in their rebellion against God by affirming the atheistic belief in evolution. What is worse is, again, how they will join forces against biblical creationists in strong mockery and ridicule, including defamation — they encourage hate (Rom. 16:17-18, John 13:35). They are false teachers (Eph. 5:11, Matt. 7:15-20). Would Jesus approve of such actions and attitudes? Some TEs spend a great deal of time and energy in this ridicule. Calvin Smith of Creation Ministries International (a former atheist) was the latest target of mocker Tyler Francke. In addition to Francke's characteristic condescension and complete lack of respect for people, he resorted to using screenshots of e-mail correspondence. These hate mails against Calvin Smith were initiated by angry apostate "Haywire the Stalker" (Ashley Haworth-Roberts, and you can see some screenshots of my evisceration of his "logic" here, click each image to enlarge). Both Francke and AH-R crave attention, and I'm not happy about giving it to them, but it's necessary so you can see some of how depraved both camps can be. Instead of joining atheists in ridicule and defamation of Christians who believe that the Bible means what it says, we are supposed to be proclaiming the gospel and destroying unbelievers' strongholds — not building up their foundations and enabling them in their suppression of the truth. Try to find what these professing Christians that adore evolution have to say about grace, sanctification, propitiation, redemption, the gospel message itself (especially salvation and justification by faith through grace), love for brethren, and the authority of Scripture. See if they glorify God, and show good knowledge of Scripture. I reckon it's safe to say that those who strengthen unbelievers in their rebellion will have to answer to God as to why they attacked Christians and helped unbelievers cling to their fundamentally flawed worldviews. Also, note the tone of the comments from anti-creationists (most of whom are atheists). An added note: OECs and TEs send a mixed message. Many claim to believe the Bible, but then insist on interpreting the first eleven chapters of Genesis according to naturalistic views, presuming to tell God what he said and meant. That's called eisegesis, which is the only way to get mega-years and evolution out of the Bible, it has to be put in first. It's difficult to witness with a Bible that they say can't be trusted at the beginning (2 Timothy 3:16-17, Prov. 30:5-6). I believe that many theistic evolutionists are not Christians, but are instead deists who have twisted God's Word to suit their own fancies. This is idolatry, and they need to repent. Some may need to repent for salvation, and some for their abuse of Christians and their support of unbelievers. ADDENDUM: A companion piece of sorts is "Making God More Attractive Through Evolution". God does not need evolution but evolution would need God. Life requires complex, interdependent processes occurring simultaneously. These processes were require design by intelligence far higher than Human which are put together and regulated by genetic material, including but not limited to DNA. Evolution is impossible and it doesn't really matter how long you give it, 6000 yrs or 4 billion. The molecules involved in life's processes were designed, selected and specialised for their purpose. It is just an illogical excuse for atheism. They would rather believe a lightning strike developed molecules that even human intelligence could not. Want my rebuttal of your claims above and in your other blog dated 6 November? Well, READ MY WIDE-CIRCULATION EMAILS. Did you address the content, or just use your typical ad hominem attacks and what passes for "logic" on your planet? Hello is all right. Ashley Haworth-Roberts is a narcissistic troll. His actions have nothing to do with science or truth. He seeks to build up his ego. His reputation has been demolished by Mr. Sorensen's refutations of his logic. Ashley Haworth-Roberts calls people who disagree with him or his religion of evolutionism a liar. He cannot demonstrate evidence of lying. The cowboy has correctly observed that accusations and claims are not proof. Ashley Haworth-Roberts is an irrational fool and a liar. Thanks for your support, Mr. Gordons. Are you one of the many people that he singled out and harassed personally in Facebook messages? I've had reports of that. Aside from the material by and about Haywire, who only received a few lines in the article, does anyone else have something to say about the main points that were made? Read my emails Sorensen. Show them to Gordons. And both of you either address their actual content - or stop falsely badmouthing me. Guess you're restricted on that Forum of Futility, huh, buttercup? I guess you're talking about e-mails you send even though you admitted on said forum that you know that you've been blocked. Also, there is nothing false in what I said. You don't have to like it, and your false accusations of "liar" (which make YOU the liar) have reduced your already nonexistent credibility into the negative numbers. Not that you can distinguish between "liar" and "disagreement about the evidence". Mr. Gordons is right, it's all about your ego. You are not in charge, and cannot insist that I ignore the content of this article to deal with your alleged e-mails, which are probably like the abusive ad hominems, appeals to emotion, and anti-logic that we have been subjected to in the past. Read my emails. They show that most of what you blogged on 5 Nov and 6 Nov was false. As is your latest evasive response above (which is similar to the latest rubbish you posted at 'God of Evolution' which I have just dismissed - in great detail). READ MY EMAILS. DEAL WITH MY EMAILS. If you refuse you will confirm to all the copy recipients that your position is indefensible. As for the BCSE I can and do post there whenever I like. At the moment I do not like. So you must access and read my emails. Don't pretend that you are 'unable' to do so. "Read my emails. They show that most of what you blogged on 5 Nov and 6 Nov was false." Easy to claim, difficult to prove. "As is your latest evasive response above (which is similar to the latest rubbish you posted at 'God of Evolution' which I have just dismissed - in great detail). READ MY EMAILS. DEAL WITH MY EMAILS." Demanding little narcissist, ain'tcha, sweetums? "If you refuse you will confirm to all the copy recipients that your position is indefensible." Argument from silence coupled with bifurcation noted. Typical of you. "As for the BCSE I can and do post there whenever I like. At the moment I do not like." Why don't I believe you? Oh, I know. Your record for honesty is dismal. "So you must access and read my emails. Don't pretend that you are 'unable' to do so. " Threats, demands, and making up your own reality. All without anything resembling proof. And refusing to address my comments (this is not YOUR Weblog). Yo'ur done here. Comments are moderated and become my property. Remember, you can have your own discussions on the topics at hand by using the social media sharing buttons beneath each post.